Fingerboard sign at the entrance to Albury Airport, January 2004. NOTE: THIS PAGE IS OUT OF DATE. IT WAS PREPARED PRIOR TO THE OPENING OF THE ALBURY BYPASS. IT WILL BE UPDATED IN THE NEAR FUTURE. Route taken: From the Bethanga Bridge over the Murray River to Hume Highway (Young St), Albury. Thence from Hume Highway (HUme St) at Albury, via Smollett St, Padman Drive, Howlong, Burraja, Savernake, Berrigan, Finley and Blighty to the Cobb Highway at Deniliquin. The Riverina Highway is New South Wales' 20th State Highway, paralleling the Murray River to the north for 230km through the Riverina region of New South Wales. It begins in the east at Bethanga Bridge, which crosses the Murray River at Lake Hume, thence heading westerly through Albury and Howlong to near Corowa. From here the highway moves north for nearly 20km before resuming is near direct westerly course to Deniliquin via Berrigan and Finley. For its entire length it carries the National Route 58 shield, which was a belated inclusion to the National Route marking system in 1974. Its late inclusion explains its out-of-sequence numbering (it is located between NR16 and NR18) - NR58 should lie north of the Warrego Highway in Queensland. The Riverina Highway is of lower standard than most of other rural State Highways and, whilst sealed along its length, it is often narrow with no sealed shoulders and the are significant lengths of deteriorating pavement. 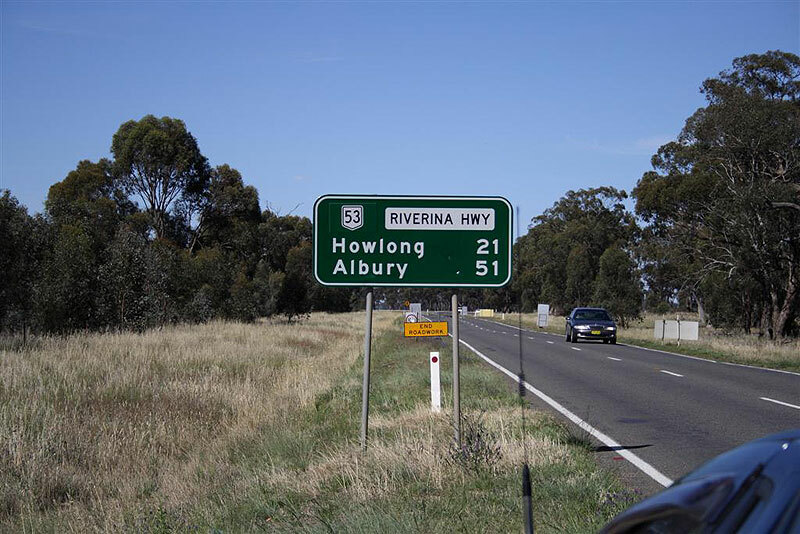 The only overtaking lanes on the whole length of the highway are located east of Albury, where the terrain is noticably hillier, however overtaking opportunities are only constrained by traffic volumes between Albury and Corowa. The worst section of the highway is the eastern-most 6km on the approach to Bethanga Bridge - very narrow and winding. Previosuly, there was some conjecture regarding what exactly happens to National Route 58 once it reaches Albury (eastbound). Shields disappear just prior to the junction with Hume Highway (Hume St) before re-appearing at Borella Road (eastern section of Riverina Hwy). From Albury onwards the signs alternate between showing a shield and showing no shield, however a reassuring factor is that all the newest signs show NR58 shields. At Hume Dam, the Riverina Highway makes a left turn to reach Bethanga Bridge (signposted "Corryong"), however not a NR58 shield is to be seen for confirmation. State Highway No. 20 was proclaimed in March 1938, commencing at Bethanga Bridge thence heading west to Tocumwal via Albury, Howlong, Corowa, Mulwala and Barooga. This routing meant the highway acted as a partner to the Victorian Murray Valley Highway, which linked major towns along the southern bank of the river. 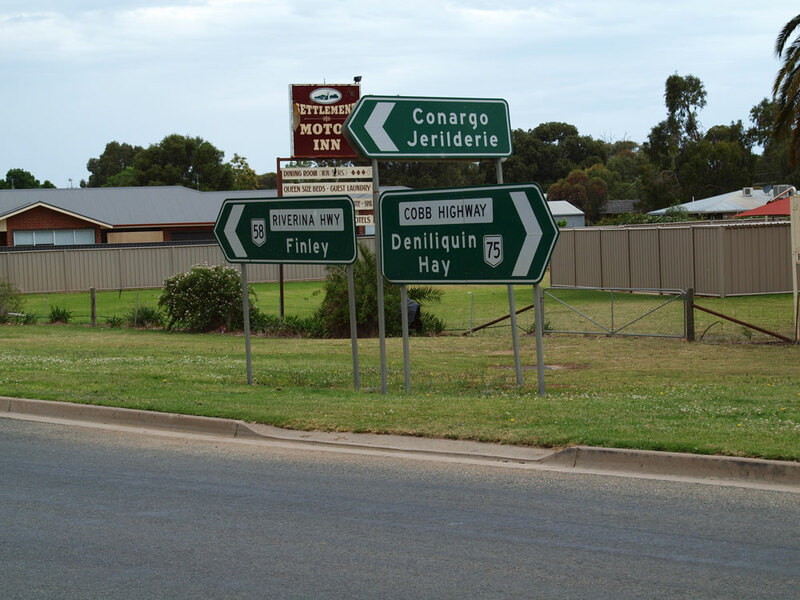 However, it was decided in the 1950s that the highway would better serve the state's transport needs if it we re-routed to the north, west of Corowa, and thus serve the major regional centres of Berrigan, Finley and Deniliquin. The highway was officially re-gazetted in October 1954 and given the name Riverina Highway, after the region which it serves so well. As part of the re-gazettal, the old alignment of State Highway No. 20 became Trunk Road No. 86 (Riverina Hwy junction to Corowa) and Main Road No. 550 (Corowa-Tocumwal). Bethanga Bridge is a 750m long steel truss bridge located 17km east of Albury carrying the Riverina Highway over Lake Hume, 3km upstream from the dam wall. It was constructed between 1927 and 1930 to replace two low-level bridges across the Hume that would be submerged by the newly-constructed Hume Weir. Considered part of the New South Wales road network, it has been the responsibility of the Department of Main Roads (now the Roads and Traffic Authority) since it opened. Currently, a 24-month, $13 million upgrade of the bridge is underway to repaint the structure and replace the 6m wide deck with new pre-stressed concrete beams. The project, due for completion in September 2006, will also see a rise in the load limit from 15t to 30t. For the duration of the work, the bridge is completely closed to traffic between 10am-12pm and 1pm-3pm Monday-Saturday, whilst a single lane of traffic controlled by traffic signals will operate at other times. Looking from Victoria into New South Wales on the bridge deck. Jan 2004. Similar view, this time showing single-lane operation during the upgrade project. Feb 2006. Distance sign with no mention of NR58 or Riverina Hwy, heading east from Lake Hume Village. Feb 2006. Looking south across Hume Dam wall, 1km east of Riverina Highway. Jan 2004. Very old black fingerboard sign about 100m off the Riverina Highway in Lake Hume Village. Jan 2004. Another old black fingerboard at the same intersection. This sign points traffic to Victoria via Heywoods Bridge. Jan 2004. AD sign approaching Riverina Highway from Lake Hume Village. Note no mention of Riverina Hwy or NR58. Jan 2004. When I saw this sign, it made me think that the Riverina Highway ended at Hume Dam! But it is actually incorrect, only right is part of the Riverina Hwy. This sign faces Riverina Hwy traffic heading west from Bethanga Bridge at the Lake Hume Village turnoff. Jan 2004. Eastbound AD sign on Riverina Hwy approaching Lake Hume Village. Note the no mention of NR58 or Riverina Hwy to guide traffic towards Bethanga Bridge (sign "Corryong"). Jan 2004. Looking east at Sandy Creek, about 10km east of Albury. The road quality lowers dramatically if you head east (towards Lake Hume) from here. Jan 2004. Distance sign heading east from Albury. Note no mention of NR58 or Riverina Highway. Feb 2006. Looking east from the railway overpass, showing construction work underway for the Albury Internal Bypass (Hume Highway), which will have an interchange with Riverina Highway at this location. Feb 2006. Looking west to the railway overpass, showing construction work underway for the Albury Internal Bypass. Feb 2006. A westbound view towards the railway overpass prior to commencement of the Albury Internal Bypass. Jan 2004. Hideously incorrect AD sign westbound approaching Hume Highway (Young St). The text should not be all caps, a NR58 shield should be shown for left (preferably along with a NR58 focal point) and the NR31 shield should be a National Highway shield! Jan 2004. ID sign assembly at the junction of Riverina Highway (Borella Rd) and Hume Highway (Young St) in Albury. Five bloody signs and not a single NR58 shield! Feb 2006. AD sign northbound on Hume Hwy approaching junction with Riverina Hwy. Note the excellent use of NR58 shield and "Corryong" focal point. Feb 2006. Hume Highway, at the 90 degree bend where it transitions from Young St into Hume St near Albury Railway Station. Note the correct use of "Hume Dam" focal point but no mention of NR58! Feb 2006. Looking east along Hume Highway (Hume Street) at a rare traffic-free moment. Feb 2006. Westbound AD sign on Hume Highway (Hume St) approaching junction with Riverina Hwy (Wodonga Place). This junction is infinitely better signed than the eastern junction. Feb 2006. ID sign assembly on Riverina Hwy at the junction of Wodonga Place and Smollett St. Feb 2006. Distance sign heading west from Albury along Riverina Hwy (Padman Dr). Feb 2006. Looking west between Albury and Howlong - this is about as interesting as it gets. Note the wide road reservation for future construction to dual carriageway standard. Feb 2006. Distance sign heading east from the Howlong-Walbundrie road, 3km east of Howlong. Perhaps Hume Dam or Corryong should be shown on this sign as well as Albury, since the highway (and NR58) does continue beyond Albury. Feb 2006. Poorly-designed AD sign southbound on the Howlong-Walbundrie road approaching Riverina Hwy near Howlong. Note that Riverina Highway & NR58 go in both directions, not just left. Feb 2006. Distance sign (with incorrect NH58 shield) heading west into Howlong from the above intersection. Feb 2006. Looking west through Howlong. 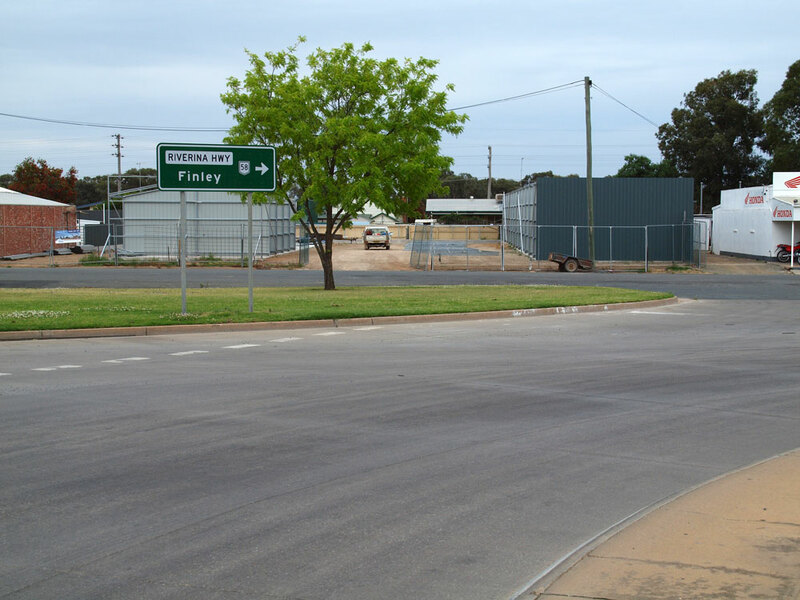 In the distance is the junction with the Chiltern-Howlong road (Sturt St), where you must turn right to remain on Riverina Highway. Feb 2006. 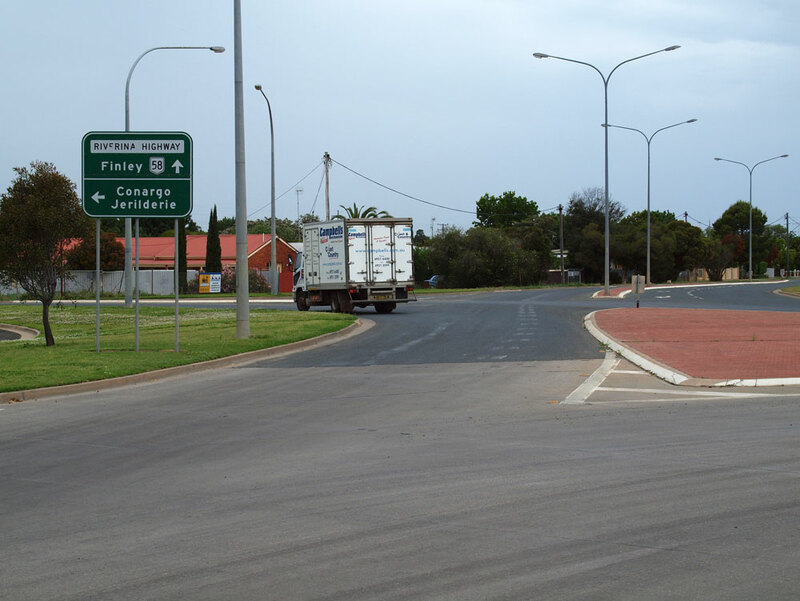 ID signs missing "Riverina Hwy" legend and NR58 shield at the Chiltern-Howlong road (Sturt St) in Howlong. Feb 2006. Fingerboad signs at the Balldale turnoff, between Howlong and Corowa. Feb 2006. Poorly-designed westbound AD sign approaching the turnoff to Corowa (although you must turn right here to remain on Riverina Hwy). Feb 2006. Distance sign heading east from the junction with Honour Avenue (the Corowa turnoff), 6km east of Corowa. Note the incorrect coverplate showing National Route 53 instead of National Route 58. Southbound on Riverina Highway approaching the Corowa turnoff. Note the incorrect AD sign says that NR58 and Riverina Hwy go left and right - they only go left! Feb 2006. Unusual use of two locality names on the one signpost! Heading north into the twin localities of Burraja and Lowesdale. Feb 2006. Distance sign heading west from the junction with the Corowa-Urana road, 5km north of Lowesdale. Feb 2006. Looking west near Ringwood, showing typical road condition. Note the lack of shoulders. Feb 2006. AD sign southbound on the Mulwala-Oaklands road approaching Riverina Highway at Ringwood. Note no mention of NR58. Feb 2006. Incorrect NR20 shield on an ID sign acting as a fingerboard, at the same junction. Feb 2006. Railway level crossing westbound near Ringwood. Feb 2006. Very old black fingerboard sign west of Savernake, with a NR58 shield stuck on the end of it. Feb 2006. The other side of the fingerboard (not visible to Riverina Highway traffic) was not lucky enough to get a NR58 shield. It also appears to have faded quite a bit more than the side visible to highway traffic. Feb 2006. Distance sign heading east from Berrigan. Feb 2006. Unusual, but correct, AD sign westbound on the Berrigan-Oaklands road (Carter St) approaching Riverina Hwy in Berrigan. Feb 2006. Looking west along Berrigan's main street (Chanter St). Feb 2006. Distance sign heading west from Berrigan. Feb 2006. Distance sign heading east from Finley. Jan 2005. ID sign at the junction with Newell Highway in Finley. Jan 2005. 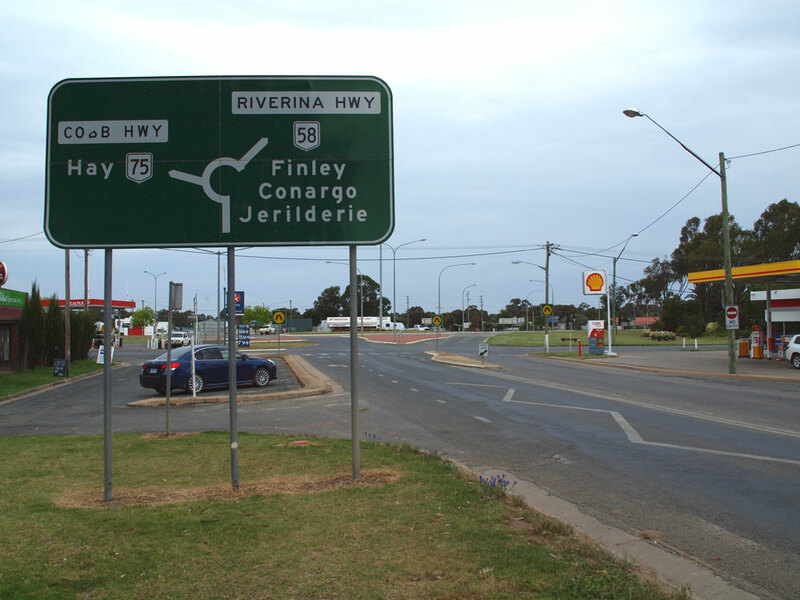 Riverina Highway ID sign at Newell Highway junction in Finley. Jan 2005. AD sign eastbound approaching Newell Highway junction in Finley. Jan 2005. Distance sign heading west from Finley. Jan 2005. Fingerboard sign with "B58" shield at Blighty. Jan 2005. "B58" distance sign, heading west from Deniliquin. Jan 2005. Black diagrammatic AD sign southbound on the Deniliquin-Jerilderie road approaching Riverina Highway in Deniliquin. Jan 2005. ID sign assembly at the junction of Riverina Highway & Wanderer Street, Deniliquin. Note the reference to Cobb Highway & National Route 75 due to the close proximity of the Cobb Highway junction. Looking southeast from the Cobb Highway/Riverina Highway junction at Deniliquin, showing the junction with Wanderer Street. Dodgy ID sign facing northbound traffic at the intersection of Cobb Highway & Riverina Highway, Deniliquin. Southeastbound AD sign on Cobb Highway approaching junction with Riverina Hwy at Deniliquin. Jan 2005.. Unusual DMR error - a NR58 shield on a black ID sign at the junction of Napier St & Cressy St in Deniliquin. NR58 does not begin for another 1km north of this sign. Jan 2005. Distance sign heading east from Corowa along the old alignment of Riverina Highway towards the junction with the current route of Riverina Highway. This section of the old highway is now known as "Honour Ave". Note the incorrect SR86 shield - an error probably caused by confusion with Honour Ave's internal classification of Main Road No. 86. Feb 2006. Looking west along Federation Ave in Corowa. This is the route that Main Road No. 550 takes today, but the Riverina Highway may have gone through Corowa town centre (via Sanger St & Edward St) prior to its decommissioning in October 1954. Looking north along Sanger St through Corowa town centre. Feb 2006. Distance sign heading west from Corowa along the former route of Riverina Highway. The Corowa-Mulwala section of the old highway is now known as "Spring Drive". Note that the focal points still reflect the former route of Riverina Highway. Feb 2006. Black AD sign northbound on the Mulwala-Oaklands road approaching Spring Drive (old Riverina Highway) near Mulwala. Jan 2004. Distance sign heading west along the Mulwala-Tocumwal road (old Riverina Highway) from Spring Drive near Mulwala. Jan 2004. Distance sign heading east from Tocumwal. Note that the focal points still reflect the former route of Riverina Highway. Feb 2006. Fading black "Corowa" ID sign at the junction of Deniliquin St & Jerilderie St in Tocumwal. Feb 2006. Looking west through Tocumwal town centre along Deniliquin St (old Riverina Highway). The highway once junctioned with Newell Highway just around the corner in the distance. Feb 2006.